Holocene jökulhlaups, glacier fluctations and palaeoenvironment, Mýrdalsjökull, South Iceland. This thesis develops a chronology of jökulhlaup (glacier burst flood) activity from Mýrdalsjökull in southern Iceland. Throughout the Holocene, the interaction of the volcano Katla and the overlying ice cap of Mýrdalsjökull have triggered many jökulhlaups. Crucially however, our knowledge of the possible flood routes is incomplete. Flood activity to the south and east of the ice cap has been well constrained from historical and geomorphological studies, but routes to the west of the ice cap have not been fully investigated. This is important for understanding the interaction of Katla and its overlying ice cap as well as from the perspective of hazard assessment. New geomorphological, sedimentological and tephrochronological data have identified 15 flow events during the Holocene. The majority of these were hyperconcentrated flow events originating from, or close to, the northwest area of the ice cap and are associated with subglacial volcanism. One flood originated in the Veiðivötn area and on 3 occasions flooding from Katla may have been accompanied by floods from Eyjafjallajökull. A further two events relate to re-mobilisation of thick airfall tephra deposits. Silicic pumice found on the sandur and close to the ice margin indicates that the Markarfljót acted as a terrestrial transport route for pumice found along North Atlantic coasts, and was possibly a route for silicic Katla jökulhlaups. Additionally, flood routes and glacial landforms show that Entujökull reached a maximum Holocene extent in the mid-Holocene, extending further downvalley than during the Little Ice Age. In prehistory, floods were directed to both the south and west of Mýrdalsjökull. Similarly timed jökulhlaups took these paths when floods also flowed from Eyjafjöll into the Markarfljót. This suggests that concurrent routing of floods to the south and west of Mýrdalsjökull is related to synchronous volcanic activity in Katla and Eyjafjallajökull. Since the 10th Century most Katla floods have been routed to the south east, possibly reflecting changes in intra-caldera eruption sites or subglacial topographic change associated with the Eldgjá eruption in c.935 AD, as suggested by Larsen (2000). The environmental impacts of these floods were significant. Late prehistoric and early historic floods had a major role in shaping the landscape faced by the earliest Norse colonisers of the region. Future flooding could pose a distinct hazard to farmland downvalley and to popular tourist areas in North Þórsmörk. Please refer to this abstract as: Smith, Kate T. (2004) Holocene jökulhlaups, glacier fluctuations and palaeoenvironment, Mýrdalsjökull, South Iceland, Unpublished PhD thesis, Institute of Geography, School of Geosciences, University of Edinburgh. Feel welcome to contact me about the project. I am preparing manuscripts for publication of the results from this work. Publications and presentations to date on this subject are listed below. K.T. Smith and A.J. 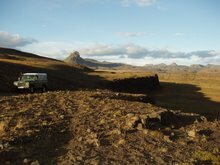 Dugmore (2006) Jökulhlaups circa Landnám: mid- to late first millennium AD floods in south Iceland and their implications for landscapes of settlement, South Iceland. Geografiska Annaler, 88A (2): 165-176. K.T. Smith and H. Haraldsson (2006) A late Holocene jökulhlaup, Markarfljót, Iceland: nature and impacts. Jökull. 55, 75-86. G. Larsen, K.T. Smith, O. Knudsen, A. Newton (2005) Jökulhlaup til Vestur frá Mýrdalsjökli : Ummerki um forsöguleg hlaup niður Markarfljót. 75-98. Report on Katla floods to west of Mýrdalsjökull to Icelandic Civil Protection Agency. K.T.Smith (2006) ´Did late prehistoric jökulhlaups make the Markarfljót a misleadingly attractive place to settle?´, seminar talk presented at the Friday Seminar Series at Nordic Volcanological Institute, Reykjavík, March 2006. K.T.Smith, G. Larsen, AJ Newton, AJ Dugmore (2005) ‘Volcanogenic floods and rain-triggered lahars: A Holocene chronology constrained by Icelandic tephras’, conference talk at MAEGS 14, 14th Meeting of the Association of European Geological Societies, Natural hazards related to recent geological processes and regional evolution, Torino, Italy, 19th - 23rd September 2005. K.T. Smith, G. Larsen, A.J. Dugmore and A. Newton (2004) ‘Floods from Mýrdalsjökull and Eyjafjallajökull: 4500BP-10th Century’, invited talk Katla jökulhlaup workshop, Reykjavik, Iceland. 4th October 2004. K.T. Smith (2003) ‘Glacier floods as landscape-forming events: their role in producing the environment of settlement, South Iceland’, conference talk at Northern Coasts and Islands: Early Connections, Canadian Studies and Scandinavian Studies, University of Edinburgh, May 2003. K.T. Smith (2002) ‘Holocene jökulhlaups in the Markarfljót, Southern Iceland: Triggers and Impacts of Large-scale Flooding’ seminar talk to the Physical Geography Discussion Group, Institute of Geography, University of Edinburgh. K.T. Smith, A.J. Dugmore, G. Larsen, E.G. Vilmundardóttir, H. Haraldsson (2002) ‘New evidence for Holocene jökulhlaup routes west of Mýrdalsjökull', poster presented at 25th Nordic Geological Winter Meeting, University of Iceland, Reykjavík, Iceland, January 2002. K.T. Smith (2001) ‘Holocene jökulhlaups, North Western Mýrdalsjökull, Iceland – New evidence and wider significance’ abstract for poster presentation at USGS Earth Systems Processes – Global Meeting, Edinburgh, June 2001. K.T. Smith, A. Dugmore and G. Larsen (2000) ‘Holocene jökulhlaup activity at Entujökull, Iceland’ poster presented at Volcano/ice interaction workshop, Reykjavík, Iceland. August 2000. K. Smith (2000) ‘Holocene jökulhlaup activity, Entujökull, Iceland’ poster presented at Iceland 2000 conference, Keele University, Keele, UK, April 2000. Hello and welcome to my Katla research page. Here you can find information about my PhD research and related more recent work as well as links to institutions and people also working in this field. For more information about me and my other research work please see my main research page.